Rome. There is virtually no one who hasn’t heard of the glory of the Roman Empire, a civilization that conquered a vast stretch of land from Europe to North Africa. The only thing that’s as fierce as their thirst for expansion was their love for entertainment, and nearly everywhere they conquered you will find grand scale amphitheatres built to entertain the citizens of Rome that settled there. In most cases, these circular structures are the tallest and most grandeur building in the city. The enclosed, usually oval, area in the middle is called arena, the word derived from the Latin word harena, a type of fine sand they put on the ground to soak up the blood from gladiator fights on the arena floor. There are over 230 amphitheatres in the world, many are in shattered or ruined condition, but there are some that had survived over almost two millennia and are still in use today. Having visited four of these amazing historical monuments, I couldn’t help but be awed by their scale and magnificence. So today, I am here to bring you the 11 amazing amphitheatre across the ancient Roman Empire, a legacy from a glorious dynasty that persisted through almost two millennia. The most famous of them all, the Colosseum is one of the most famous landmarks in the world. It was built around AD 72-80, it also bears the name of the Flavian Amphitheatre. Made of stone and concrete, it can hold up to 80,000 spectators and held events from gladiator fights, executions to dramas. Though partially destroyed by earthquakes and stone robbers, much of its exterior still remained intact; however less can be said about its interior. While you can still admire the stone pillars rising in neat successions, the arena floor is completely gone, revealing the labyrinth of chambers they kept prisoners and beasts. Don’t have too much time to spare to plan your Rome getaway? Go on a pre-planned adventure that includes a tour of the awe-inspiring Colosseum. 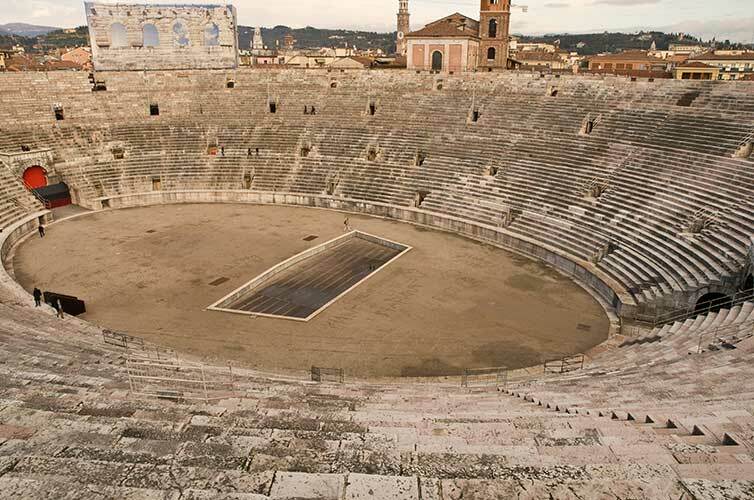 Arguably the best preserved Roman Amphitheatre, the reddish appearance of Verona’s own arena might not be as inspirationally beautiful as that of the Colosseum or as photogenic as the ruins of the one in Pula. However, its interior is so well-kept that it allows regular entertainment to take place in its arena. Fitted with a stage, ground level seating and fitted chairs on the lower half of steps, you can better appreciate the stunning architecture by climbing up its smooth, pink marble steps. 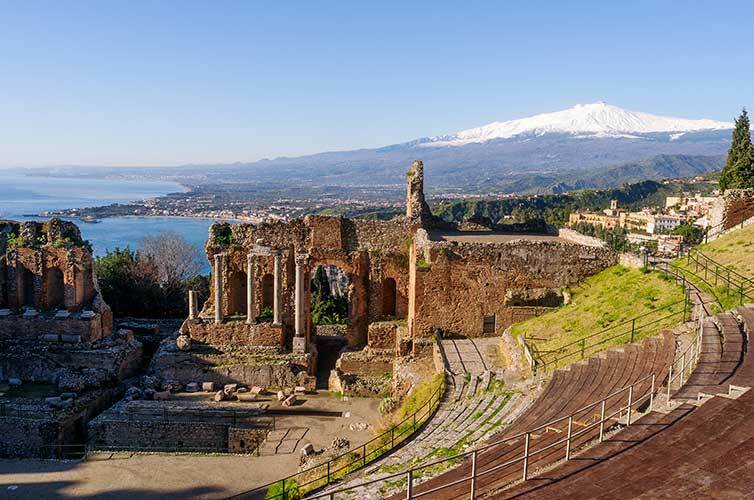 Built even earlier, in AD 30, it only suffered damage to the outer ring from the 1117 earthquake and now it is home to the Opera Festival that occurs annually in September. Situated on top of a cliff, this amphitheatre offers one of the best views of its kind. Using the hill to its advantage, this particular arena is only half-oval in shape, with the stage backed by a row of tall columns. These particular columns have now slumped in the middle, which conveniently offers a stunning vista of the Bay of Naxos. Some sources say that this theatre dates back to the Greek period; however, the brick structure indicates that it is of Roman origin, possibly one built atop the original Greek counterpart. The amphitheater in Pula is the sixth largest surviving Roman arena and one of the best preserved ancient monuments in Croatia. The amphitheatre of Pula is a stark contrast of gleaming white limestone to the pink-red appearance of its cousin in Verona. Built around AD 27 – 68, the arena is built into a hill that is compensated by an extra story on the seaward side that reaches a height of 29.4m. It is rare in the fact that all of the four towers and three roman columns survived through the ages. Most of its damage was due to quarrying for stone, and it was used as a grazing ground and sites of fairs through the middle ages. Fun fact: in 1583, when it was under the rule of the Venetian Empire it was suggested to move to Venice, luckily, or unluckily it was rejected. 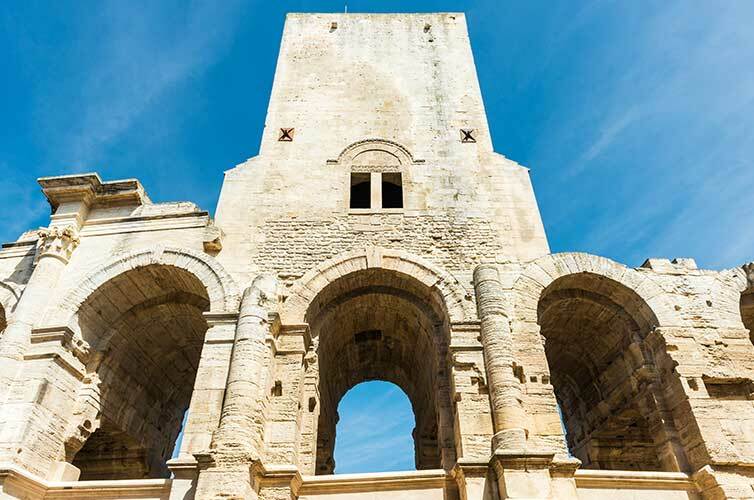 An amphitheatre with a twist, the normally uniform oval shaped exterior of the Arles arena is punctuated by four medieval towers that superimposed on the exterior arcade. They were added on this 1st century AD structure after the fall of the Roman Empires, when the amphitheatre became a fortress, a small town completed with its own chapels and remained so until the late 18th century. Today, it has returned to its former glory and is home to the bullfighting games during the Feria d’Arles, which is held biannually in September and April. 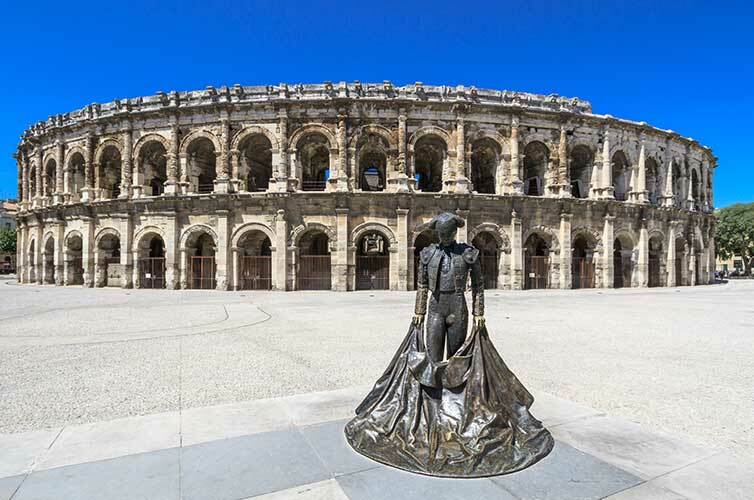 Constructed in the late 1st century AD with the Colosseum as a model, the Amphitheatre of Nimes is a smaller version of the one in Rome, seating over 16 000 people, but shares a history similar to its cousin in Arles. Serving as a fortress during the turbulent years in the medieval time, it escaped the ravages of time against all odds and emerges as the best preserved Roman Amphitheatre in the world. It was refurbished in the 19th century as a bullring for the biannual Feria de Nimes, and now equipped with a movable cover and heating. The amphitheatre of the ancient city of Leptis Magna in Libya is only part of the large expanse of ruins that was once the thriving center of Roman Africa. The city was destroyed in the AD 356 Crete Earthquake, and the amphitheatre was excavated after the city was rediscovered in 2005. Situated 1 km from the city and built on a depression, it can seat up to 16,000 people and the arena is overgrown with grass and littered with stone rambles. From its inscription, it is deduced to be built around AD 56. One of the oldest amphitheatres on the list, the Merida Arena was built by 8 BC in a city that was founded by the Empire Augustus in 25 BC to resettle two legions of soldiers from Cantabrian Wars. It could seat up to 15,000 people and the upper tiers have fallen victims to stone quarrying over the centuries. Consisting of less costly materials it is certainly less glamorous than many of the others. It is situated next to the Roman Theater, which is only about 2/5 of its size, both of them dominating the middle of town. The Oldest amphitheatre of the list, Tarragona Amphitheatre is a ghost of its former glories. Built in AD 2, the amphitheatre beholds a spectacular view of the sea and can hold up to 15,000 people. It witnessed the burning of three Christians on 21st January, 259 and transition into Christianity as a consecrated ground. It stood through subsequent Islamic Invasion, becoming abandoned from the 12th century onwards, and only disturbed by stone robbers. The city of Octodurus, a Gaulish settlement from 1 BC was conquered by the Romans in 57 BC. The grey bricked amphitheatre is one of the smallest on the list, holding only 5,000 people. There isn’t much information on the city during the medieval time, and it was restored in 1978. It is now home to the annual cow fights held in early autumn during the Comptoir. 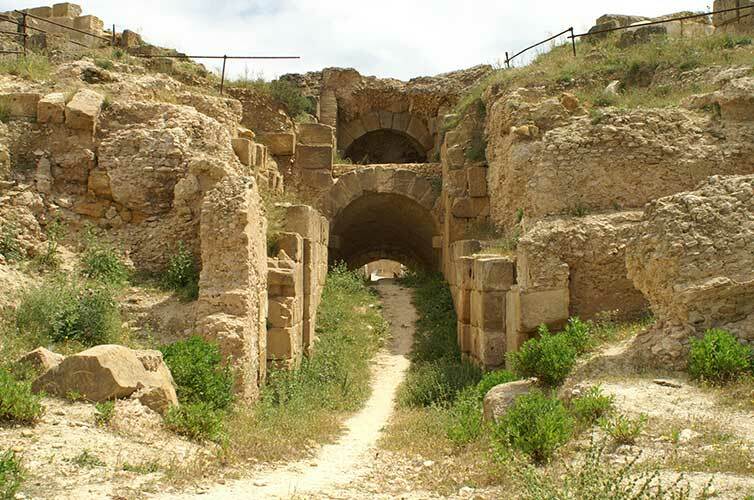 Another ruin in Africa is home to an amphitheatre, The Uthina Amphitheatre is situated in Northern Tunisia. With a capacity for 16 000, this white washed theater is half built along the side of a hill. It is now part of the archeological site of the Oudna city, alongside with the theater, three thermal sites and the Temple of Juno. Ready to explore one of these awesome amphitheatres? Make sure to save on your flight and accommodations with exclusive student discounts. Blogger Bio: Nam Cheah is a third culture millennial who spent half her life in Hong Kong and the other half in UK. Planning to make the most out of life, she plans to document her passion to laugh, travel and eat on her blog: Laugh, Travel, Eat. When she’s not doing any of that, she’s either catching up on TV while online shopping or writing her novels. You can find her blog here.